Let’s start off with our new website. Powered by our new Baton Pro theme, the new design is cleaner, faster, and includes many improvements compared to the previous design. Our new website also utilizes our Note plugin and of course Conductor throughout. Our new pricing model includes three plans for Conductor: Personal, Professional, and Lifetime. We’ve simplified our existing model, and expanded features of each. One of the areas on our old website that was lacking, and with Conductor in general, was our developer documentation. When we announced a new website, we also announced updated developer documentation. We’re happy to announce that we now have developer docs! The aspects of Conductor which we consider to be the most frequently utilized are documented. At this time, there are other areas which we haven’t yet fully documented. In the future we’ll have documentation for these areas. We’ve also created some helpful guides to help you understand the in’s and out’s of Conductor HTML markup and CSS. We’ve also documented the Conductor Widget Query PHP classes, various hooks, and various functions throughout Conductor. We hope that this documentation will help developers understand the more popular inner workings of Conductor. We are, of course, always available to answer any development questions that you may have as you dive in. Going hand-in-hand with our new website launch, we’ve launched a new version of Conductor. We released version 1.4.0 today, and it includes some exciting new features. This is an exciting new feature for Conductor. We’ve made the process of installing and activating Conductor add-ons much easier. Previously, if you wanted to install an add-on, you had to log into your account, download the add-on to your computer, upload it to your WordPress site, and activate it. This process changes today. You can now install and activate add-ons within Conductor. All you need is a valid Conductor license. Activate your Conductor license (Conductor > License) and then head on over to the add-ons page (Conductor > Add-Ons). The new Conductor add-on install/activation process. Once you’re on this page, you’ll see all of our add-ons along with options to install, activate, and deactivate each one. Please Note: Some of our add-ons require additional assets (such as the Genesis Add-On) and thus cannot be activated without those assets. Conductor will report any messages generated by add-ons which require additional assets on this screen during activation. If a required additional asset is missing, you’ll need to install it first and then try again. This field is populated when the Conductor Widget is placed into properly registered WordPress widget area. If the before_widget parameter for a widget area does not contain an HTML ID attribute, this value will remain empty or incalculable. Please Note: Due to the nature of WordPress widget areas, Conductor Widgets will oftentimes have to be saved at least one time in order for this value to be populated. At this time, this setting may not display a value during a session in the Customizer for newly added Conductor Widgets. This setting is read-only. In addition to the add-on enhancements and the CSS ID Conductor Widget setting, we’ve also added support for custom post types to Conductor content layouts. Previously, Conductor content layouts only supported post type archives for custom post types. This update adds support for single custom post type posts. 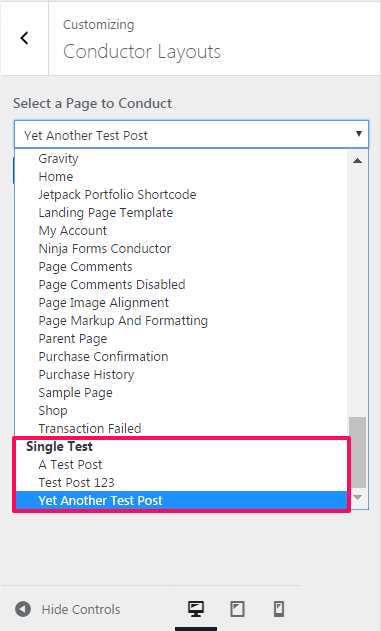 You can now easily add a Conductor content layout to a single post within a custom post type, which was only previously possible with Posts and Pages. Please Note: This enhancement depreciates our Custom Post Types Gist. Along with all of the above changes and updates, we’ve decided to put the Conductor code base on GitHub. Since many of our other products are already on GitHub, we wanted to provide a way for developers to browse the Conductor code base easily as well as have an opportunity to learn and to submit issues or pull requests. We’re super excited for our new Query Builder Add-On! The Conductor Query Builder Add-On allows you to craft more complex queries, while still using the familiar Conductor interface. Virtually any query that is possible via WP_Query can be created via our new query builder interface. In this add-on, queries are created in the WordPress admin via Conductor > Queries. Each query has the option to have a title, notes about the query (for internal use only), the query arguments for WP_Query, display settings (via the Conductor Widget interface), and a front-end preview based on the query. Queries that are created with our Query Builder Add-On can be inserted into content via a [conductor] shortcode or a Query Builder widget. We can’t wait to see what you create with this add-on! This add-on is included in all of our pricing options. This add-on is also available on GitHub. P.S. – While we’re on the topic of add-ons, we have two add-ons currently in the works for Gravity Forms and Ninja Forms which we hope to release soon. Please Note: We’ve updated our other add-ons to be compatible with the Query Builder Add-On, so you’ll want to update those too.